“Whoever spares the rod hates their children, but the one who loves their children is careful to discipline them” (Proverbs 13:24). Many of us have heard the phrase “spare the rod, spoil the child” based off of Proverbs 13:24. Growing up I believed that this scripture was primarily for spanking children in order to keep them in order. However, after having children of my own—I realized that this scripture is more than just corporal punishment for bad behavior. The rod refers to the discipline, protection, authority, and power that God as the Good Shepherd gives to His children. As parents, we are compelled to follow His example in order to raise a godly generation to build up the kingdom of God and complicate the plans of our united enemy, Satan. The mantle of parenting is a short season of stewardship that requires the discipline, protection, authority, and power of God. “Folly is bound up in the heart of a child, but the rod of discipline will drive it far away” Proverbs 22:15. Children are young and immature because they lack experience or wisdom. In this situation it’s less necessary and effective to use corporal punishment for their childish behaviors. Rather it’s an opportunity for parents to teach their children the fruits of discipline through teaching and training. The Bible is one of the most effective strategies parents have available to them for disciplining their children. However in order to do so, parents themselves must take the time to be intimately acquainted with the Word of God as well as living what it teaches. The scriptures set deep in a child’s heart at an early age and will still beckon them when they become adults. Speak the scriptures towards specific behavior when disciplining your children in the home. Read Proverbs 22:6, 1 Corinthians 4:21, and Hebrews 12:7-8. As good stewards of God, parents have the responsibility to protect their children. We protect our children not only by providing the basics necessary for their survival (adequate food, water, clothing, and shelter). We also protect their spirits and minds by taking heed to their friends, their entertainment preferences, and their conversations. Parents must take this step of protection with wisdom and insightfulness from the Spirit of God. They must not create an environment of fear, but rather welcome the stretching of their children’s faith in preparation for dealing with the flesh and the world. This stewardship can’t be accomplished by locking children up. There needs to be a balanced approach that encourages maturity and the seeking of God’s help with their difficulties. Read Proverbs 31:27; 1 Corinthians 15:33, and 2 Timothy 1:7. Many people resist the compelling of the Holy Spirit because they don’t want to submit to the authority of God over their lives. They are driven by a rebellious and stubborn spirit that will only lead to their demise in this life and the one to come. Children who are raised to respect the authority of their parents are more likely to deal effectively with other authorities in their lives. The proper and balanced authority from godly parents is rooted in love. It’s their unconditional love coupled with a standard of respect and proper behavior that builds a strong foundation that lasts a lifetime. 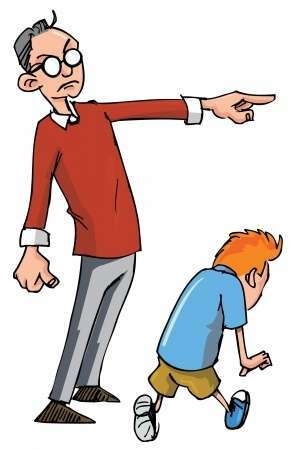 The rod of authority should be established the first time a child attempts to resist following clear instruction from their parents. Read Luke 4:32, Romans 13:1-6, and Colossians 2:10. God used His rod of power to bring down nations as well as individual people. He will punish the evil doers because He is a good God and not oblivious to their sins. Many people have come to know Jesus Christ because He allowed them to feel the painful consequences of sinful behavior. Godly parents have to follow the Lord’s example of allowing their children to suffer. If they always rescue children from the results of their sinful behavior, then their children are doomed to grow up to become irresponsible adults without regard for their decisions. The Holy Spirit provides discernment for parents to give out the specific punishment for each child. However this takes restraint on a parent to not punish out of anger, impetuously speak without deliberation, or to delay righteous punishment. Read James 1:19, Philippians 1:10, and Job 4:8. Parents who love their children and recognize their role as stewards over them use the rod with wisdom from God. It takes effort to invest the time, money, and energy necessary so that they will be well balanced spiritually, emotionally, physically and intellectually. The difficulty of raising children is offset when parents diligently follow the leading of the Holy Spirit in conjunction with the careful study and application of the Word of God. The mantle of parenting is a short season of stewardship that requires the discipline, protection, authority, and power of God. When raising godly children, parents experience the awe and understanding of God’s love for His people. Use the rod to follow the example of God the Father in order to raise a godly seed in this earth. You give good advice. Jesus Christ is our Staff and His word is the rod. If we neglect to teach our children the word of God, they are spoiled, or we do not love them. Jesus would never suggest that we beat children but if we teach them of Christ, their love for him will motivate them to do good. I always find it interesting at people automatically associate the ‘rod’ with a switch for hitting children. The Hebrew word is the same as that of the rod a shepherd carries – a common and well understood tool for the Israelites. The rod was not used for hitting sheep! Rather for what you shared – guiding, correcting by redirecting, protecting… Not beating! This article gives SO MUCH clarity to the scriptures’ references about disciplining children. Proverbs 13:24 has been misquoted for countless centuries. Sad, but true! I thank God’s Holy Spirit for using you to shed some much needed light on this controversial topic!!!! I totally agree with Leah and Cindy! Thank you Lord for Your Holy Spirit giving us discernment! In modern times DNA has vindicated many innocent and has proven that the death penalty has been imposed wrongly on numerous occasions. Do we who are followers of Christ continue to pick up the stones to impose our judgement and punish others for their perceived wrongdoing? The Proverbs are sayings that are part of the divine oracle of God. But at the end do you really believe you can be led by the gentle Spirit of God to deal out corporal punishment? Rather, I say this idea of corporal punishment seeks to return to the old covenant and its mentality. In my opinion people who think to use violence against children ought to reconsider having them. The New Covenant surely knows nothing of such behaviour. Hello Mr. Roberts. So you believe today is different than in the Old Testament and that God was wrong for taking a life for someone taking another life? Yes DNA has helped, but ultimately all things will be made right and even if we are wrong about some criminal, in the end, God will see that justice is done and no one will get away with anything. Christians are not judging or picking up stones but following the God-ordained law enforcement officials to do His will as they are His sovereign agents and not we or you. I believe it is a deterent for others not to murder, and the ones that are proved innocent by DNA on death row are less than 0.01% so you are willing to throw out the death penalty because of DNA. I disagree. God’s ways are always superior to mine and to yours. I know this is your opinion, but I stick to God’s Word and not human pursausion. Previous post: What Is The Meaning Of The Christian Fish Symbol?